Tickets Louis Vuitton Foundation - Buy tickets for the Louis Vuitton Foundation in Paris with "skip the queue"
Let yourself be amazed by the beauty of the Louis Vuitton Foundation, a building which is designed in the shape of a boat and is constructed of more than 3,000 glass panels which give off spectacular reflections. We are talking about one of the most important Parisian icons which you can reach in comfort on board a free shuttle service as well as enjoying the feature which allows you to "jump the queue". Immerse yourself in a unique experience amidst some of the most beautiful contemporary and modern works of art in the world. The Louis Vuitton Foundation strives to support the arts, culture and the area that it covers. It has supported the arts since the moment it was built, in fact, the Foundation is an open-air work of art in itself which was designed by the famous American architect, Frank Gehry. A really exceptional construction in the form of a boat with open sails, it was built with more than 3,000 glass panels which facilitates the perfect natural lighting in which to exhibit its works of art. Inside the building, you will be able to visit a large and valuable collection of contemporary art by artists of every nationality. 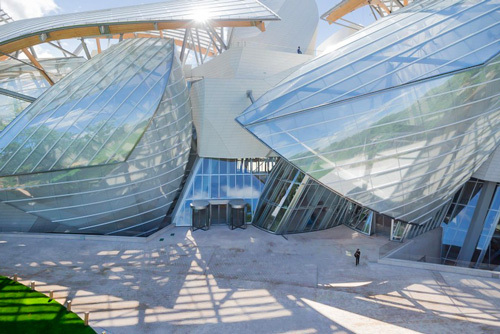 Bernard Arnault, the founder of the Louis Vuitton Foundation established this extraordinary venue in the 16th arrondissement of Paris in order to add further value to the area and to make it better known. Unrestricted access so you can arrive at a time to suit you. By buying your tickets on-line, in addition to being able to use the free shuttle service (back and forth), you will also be able to access the art galleries by jumping the queues at the entrance so that you can admire this beautiful two storey glass building and the modern and contemporary art exhibitions inside. It is important to make your purchase on-line as only a limited number of entry tickets are available each day and by booking in advance you will have the assurance of being able to visit this marvellous building without any problems. .
On the day of your visit, just show your tickets on your smartphone and "Jump the Queue." By buying your tickets on-line you will be able to jump all the queues and arrive directly at the Louis Vuitton Foundation with the free shuttle-bus service. The meeting point for the shuttle is in Place Charles de Gaulle on the corner of Avenue de Friedland. The Foundation is open every day of the week except on Tuesdays and on public holidays. Saturdays and Sundays: from 12:00 to 20:00 hours.